Community College Success: Have You Decided? I’ve always admired people who can speak a variety of languages. And I’ve always been completely inspired by those who are able to come to a new country and not only learn the language but also excel in reaching their goals and creating a better life for themselves and their families. I have long been enamored with such talent and accomplishment, but it wasn’t until recently that I came to understand that admiration could be bestowed on my very own grandparents. They came from Puerto Rico to New York after they married – not knowing any English – and worked as hotel janitors for their entire lives. And I always reluctantly say no and that I wish I did and that I’m planning to learn one of these days. This isn’t something I just say. I have wanted to make the commitment to learn for a long time. Three years ago I even bought one of those high-tech learn-the-lanugage-in-6-months full immersion computer programs. And it has sat in the back of my closet with my old Sims games ever since. But something changed last week. It wasn’t some big epiphany or moment that finally made me realize all of my excuses (e.g. it will take to long to learn a new language, what will I really do with the skill once I have it, I won’t really be able to learn unless I live somewhere where they only speak Spanish anyways…) were unfounded. What changed is that I finally made a decision. I am going to learn Spanish. For years I have told people I “wanted” to. I even bought the learning software, which may seem like a decision, but it wasn’t. It was all just a show until I really decided. So last week I dug through my closet and old computer stuff and found the brand-new-never-opened Spanish language learning software and put in the first CD and started (“la leche…el servico de señoras”). How often in life do we move forward with things and realize - though we’re going through the motions - we still haven’t fully committed? How often do we act like we’ve decided when really we’re just trying to put off the decision because we’re afraid? I find many students in college who are simply going through the motions -- taking classes, picking a major -- but they are far from committed. They are going to college, but they haven’t decided to get an education.They haven’t decided to succeed. They haven’t decided to do their best. They haven’t decided why they are there at all. What about you? 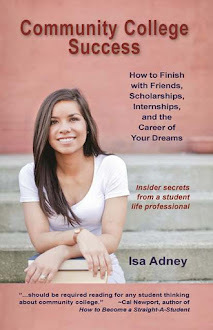 Have you decided that you are going to make the most of your college education – whatever it takes? All it takes is a decision. And it doesn’t come by magic or even an inspirational epiphany. It just comes from you. It can only come from you. So whatever you’ve been putting off, wherever you’ve been aimlessly wandering, decide to make a decision about what you are trying to achieve. Decide that it is going to happen. Decide what you are going to give. And then once you’ve decided – do.